It’s finally getting warmer in Canberra and with it comes all the social activities involving food! Get excited Canberra! 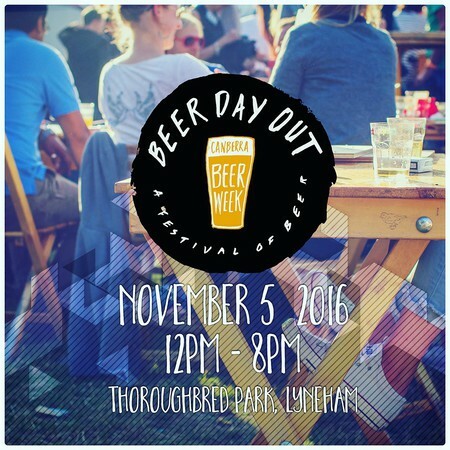 For all the beer drinkers out there, Beer Day Out is happening again! Beer Day Out is going back to Thoroughbred Park in 2016. Saturday Nov 5 will see some of the best breweries Australia and New Zealand have to offer along side some of Canberra’s top eateries.This year we are introducing The Festival Bar which will pour a special beer supplied by each brewery attending. We are also introducing the BDO beer paddle; so you can try even more delicious brews. The BeerDiva is back running her acclaimed beer masterclasses alongside all round TV personality Paul Mercurio who will hosting cooking with beer masterclasses. DJ’s, beer games, trivia and roving entertaimant will round an awesome day of hops and happiness! Our next event will be held on Saturday the 12th of November at The Little National Hotel in Barton. Come and join us for the last Forage of the year starting at 2pm until 7pm. Come by for some of THE BEST Street Food, Beverages & Live Music Canberra has to offer. The market kicks off 5pm Friday 18 November with live music and a night feast with food from The Forage. The market runs on Saturday 19th November 10am – 5pm and Sunday 20th November 10am – 3pm. If you love wine, you better buy your tickets ASAP! The Canberra District’s wineries are coming to the heart of the city so that over two evenings you can enjoy the region’s best wine and food without leaving the city limits. The event will be lit with festoon lights, local musicians will provide the soundtrack to the evenings and the great street art in Tocumwal Lane will provide the backdrop. This 18-19 November head to the city to enjoy all the region has to offer. 9th – 18th December ~ The Commons Street Feast is coming! And boy, the line up looks spectacular! Did you see their butler option? Oh my! Indulge your senses at The Commons Street Feast in Commonwealth Park this summer. From the 9-18 of December you’ll be able to feast your way through The Commons with some of Australia’s best food trucks, artisan chefs, craft brewers and more. Canberra will be The Commons national debut feast, opening for dinner each night across the ten days plus lunch on weekends from 12pm. The Commons is a free event and is open to all ages, with licensed 18+ bar areas on site. Explore the very best food, wines and craft beer at The Commons this December. I like two out of three of those things! Count me in! I also have heard multiple whispers of Goodberry’s opening in Gungahlin(??). It’s all happening in the capital! I have always been disappointed with the food choices when the beautiful Enlighten festival comes to Canberra. It always reminds me of the over priced, mediocre food that you would find at Floriade, but one event at a time. This year, the Night Noodle Markets presented by Citi will coincide with the Enlighten Festival, bringing with it a whole lot of yummy food from interstate as well as some Canberra locals including Morks and Thirst Thai. I have finally found the list of vendors who will have a stall at Canberra’s first Night Noodle Market.